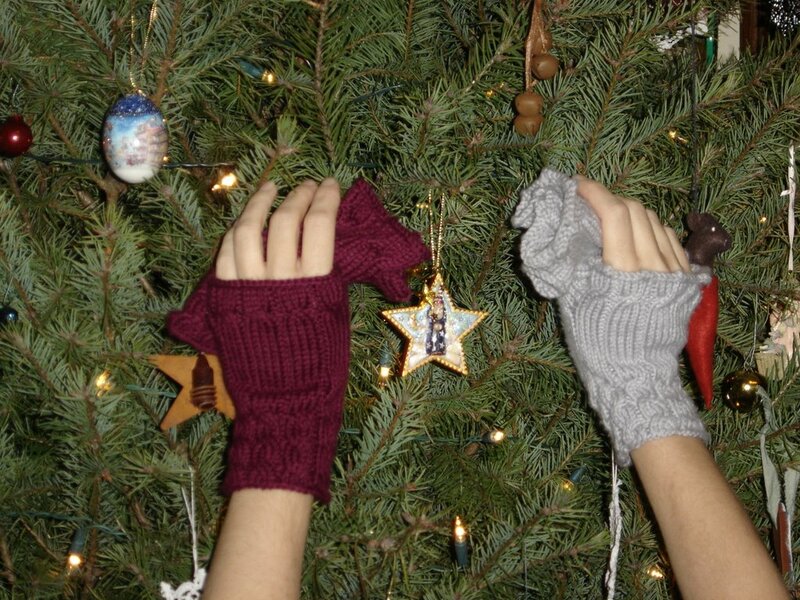 I think just about everyone is knitting some Fetching mitts for Christmas. The gray pair are the ones I knit up for myself during Skate America. I've been wearing them non-stop and love them, except for my picot cuff. So on my Christmas knitting pairs, I am opting for a plain bind off. The maroon pair is for my MIL, and I'm very happy with how it came out. Let's hope she is too. So, with less than a week to go, here's where the list stands. Socks - will be done tonight, oh yes, no matter what!!! Fetching - don't need to be gifted until 12/30, so I can worry about these next week. I absolutely can't wait to cast on some STR and knit myself a new pair of ribbed socks. I think that's what I'll be doing Christmas night!! In other crafting news, as I wrapped presents today we ran out of gift tags. So, I used my new sticker maker and my graphics program to whip up some home-made ones!! I think they came out really cute. Here's a little sample of how they'll look. You'll be finsihed with your to do list in the next five days, I just know it!!!! And those stickers are so darn cute!!!! You are the Rachel Ray of graphics and crafts, I tell you!!! Back to my knitting . . . ugh. I will have to make a pair of those someday. Love the Christmas tags!! I'm sure you will get everything done by Christmas. I just cast on & off my first Fetching this evening. I did the plain bind off as well - partially because I didn't feel like taking the time to learn the other way. The gift tags look great! Those Fetching are great (dare I say they are fetching? )..I so have to knit a pair sometime..Maybe for my younger sister for her birthday. LOVE the cards! You have done a fantastic job...I have so many of them in my house..I found last years after buying more for this year (and I found the years before after buying more for last year)..sigh. Cute stickers and fetchings! I've been debating about whipping out a pair for my mom. We did Christmas at Thanksgiving because my brother was here from Denver. But I think she could use some Fetchings. 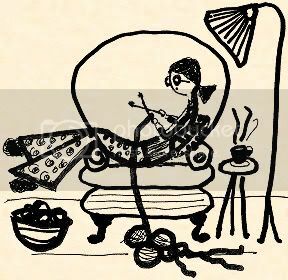 I really need to win the lottery so I have more time to knit. I, too, have faith that you are going to finish all your presents in time. It seems manageable! Since you're almost done with your knitting list, do you mind if I send some of my UFO projects to your house for finishing? I swear I'm so far behind, I'll never catch up. Congrats to you for being in the home stretch! I LOVE your stickers. TOO CUTE! I've been wanting to make some Fetchings, but haven't gotten the chance. Maybe in January. . .
Love the gift tags! Very fun. I'd better get wrapping too. Wow, you have been so productive! THe stickers are really cute and the Fetching with a straight bind-off looks much neater. I will definately try my next pair in that fashion. Enjoy yourself today! Go you!! You can do it! I know how you feel. I'm knitting as fast as I can! Eeek! Good luck on the rest of your knitting, I believe you can finish. Ok, wow again! I love those mitts. I am still working on a pair that I began (embarassed face here)last year and have yet to finish. You are too awesome! 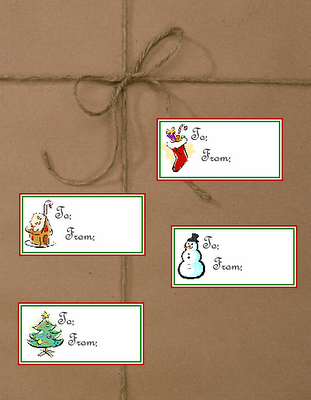 Cute wrapping and gift tags!